« Is It Still Pumpkin Season? I Hope So! Because Here's One Stuffed with Everything Good! The rolling below sounds more complicated than it needs to be. Just slap a leaf down on your work area, add some filling and roll. 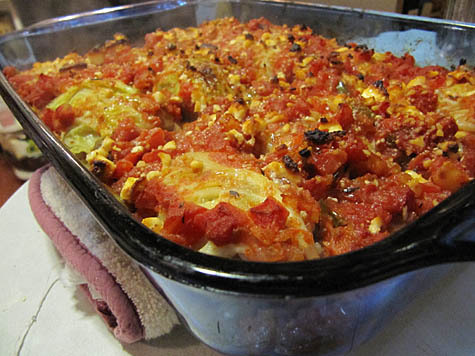 Place in a rectangular baking dish. Do another one. Another one. Another one, etc…If you cook them on the stove top, as the original recipe did, you may want to seal better (like a burrito), but for baking, I just rolled (because that’s how I roll?). The ends were open but all the filling stayed in and it worked fine. Let’s see, I also swapped the parsnip for a green bell pepper, as that’s what I had. When I baked mine, I did not cover with foil and subsequently, my feta got a bit burned. Next time, I will use foil for the first part of cooking and I’ve added that to the directions below. I think that’s about it. Wow, these were delicious! Preheat oven to 375 degrees F. Bring a large pot of water to boil and salt it. Add the cabbage leaves to the boiling water a few at a time and cook for 30 seconds to one minute, or until theyâ€™re just pliable. Carefully remove the leaves from the water with a slotted spoon and transfer to a colander; rinse with cold water. Gently squeeze the leaves to remove most of the excess water, leaving them just damp enough so they will stick together when rolled. Put 2 tablespoons of the olive oil in a large pot or Dutch oven over medium-high heat; when hot, add half the chopped onion and half of the minced garlic, along with the carrot and half the the bell pepper, and cook until soft, about 5 minutes. Sprinkle with salt and pepper and transfer to a bowl along with the lamb and rice. Mix until just combined. Wipe the pan, add the remaining 2 tablespoons olive oil and turn the heat to medium-high. When the oil is hot, add the remaining onion, garlic and bell pepper. Cook until soft, 1 to 2 minutes. 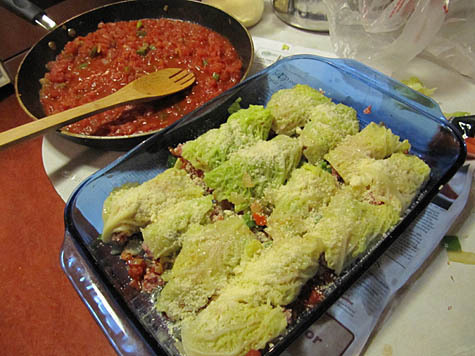 Add the tomatoes, thyme, red pepper and a good sprinkling of salt; cook over medium-low heat while you prepare the cabbage leaves. 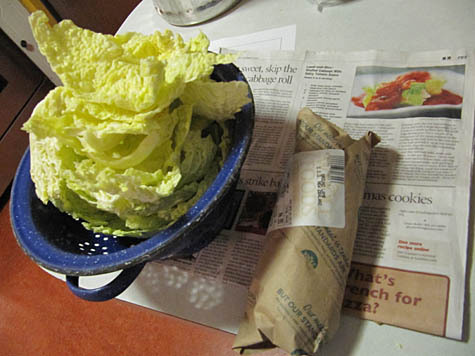 Cut the cabbage leaves in half by running a sharp knife along each side of the stem, removing the stem in the process; trim the top and bottom so youâ€™re left with a large rectangle. Lay a leaf on a work surface with the wide edge facing you. 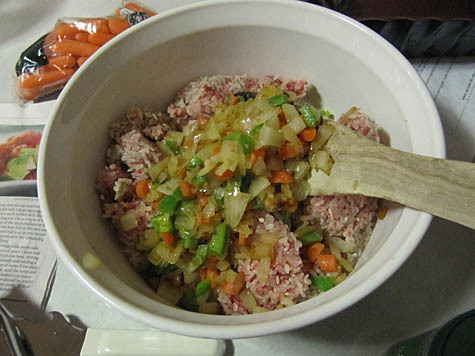 Put a few tablespoons of the meat mixture in the middle of the leaf, and roll it up. Repeat with the remaining leaves and filling. 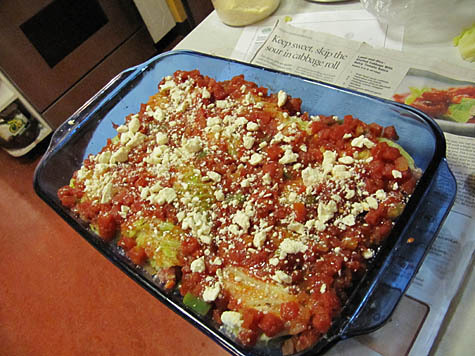 Lay all the leaves into a lasagna pan and spread out as you need to for fit. Sprinkle with the parmesan cheese. Pour the tomato sauce over the rolls, spreading it evenly and making sure some gets down in between the rolls. Sprinkle the feta on top here! Cover with foil and bake 30 minutes. Remove foil and continue baking for 15-20 minutes. Serve immediately. These are seriously so good! Better than anything with cabbage as one of the main ingredients should be (!!! )…go make some now. 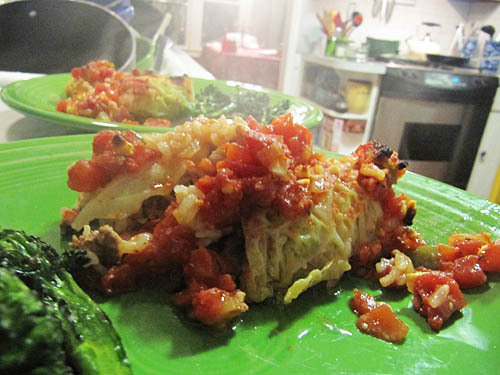 This was the best stuffed cabbage that I’ve ever eaten! The lamb and the heat of the red pepper flakes enhanced the flavor. 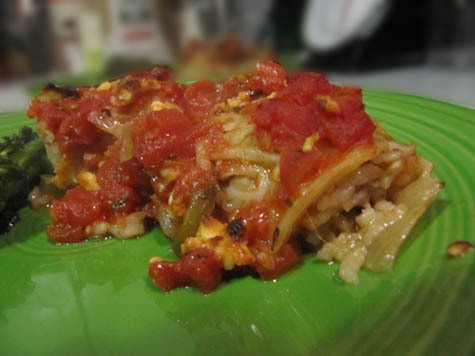 The recipe doesn’t say when to add the feta, but I added it to the meat-rice mixture, even though you probably added it to the top (from evidence in the photos and introduction). Because the savoy cabbage head I used was small, I added the extra meat-rice mixture to the sauce, which worked out well. I LOVE this recipe! I belong to a foodie group on Facebook and we have recently started “challenges” with secret ingrediants, this week is “challenge cabbage” and I’M MAKING YOUR RECIPE!!! I will let you know if I win!! !